Are Any of Your Ancestors in the Book of Witches? The book finally arrived. Set against a stark black cover is the gilded title: “Associated Daughters of Early American Witches, Roll of Ancestors.” It is quite impressive to look at and I must admit the pages are burning with a little more than just history and genealogy. There is something more in here. Of course, I poured through it, wondering if my own family might be included. There are over 300 “witches” mentioned and each entry includes birth, death, parents, spouse, children, accusation and references. There is a handy index in the back, as well. And you might be surprised how many national figures from our early American history actually show up in this book! John and Priscilla Alden, Ann Hutchinson….and ancestors of many famous people. But what about my own? I wondered. Most of my early Americans were in Virginia during this time period. This society (and this book) honors the ancestors of women who were mistreated during the Witch Hysteria in Colonial America prior to 31 December 1699. It covers all of the colonies, however, unfortunately not much remains from the south as many court houses and records were destroyed during the Civil War. But I do have some New England lines and I decided to check them out. I journeyed back in time to a world of treachery and suspicion. No one was safe. If you were beautiful, you had sold your soul to the devil. If you danced in the woods, you were worshipping Satan. If you were a healer, a visionary, if you were gifted in any sort of way, if you had different opinions or beliefs…it was very likely that you would be accused of witchcraft. Those accused were imprisoned, tried, tested, tortured and either acquitted or put to death. Imprisonment was awful. Some were taken from their sickbeds and locked away for months. Women gave birth in these prisons, in shackles and in chains. Others died due to the deplorable conditions before their sentence was announced. My part in this story begins in 1607, with Thomas Andrew Sanford, my 10th great grandfather. The lineage is a long one: myself, my father, Ada Johanna Knuppel (my grandmother), Mary Winifred Chambless (my great grandmother), Mary Virginia Brown (2nd great grandmother), Sarah Amanda Roberts (3rd great grandmother), Eliza Brown Lancraft (4th great grandmother), Nathaniel Lancraft (5th great grandfather), Sarah Jocelyn (6th great grandmother), Abigail Abbott (7th great grandmother), Anna Sanford (8th great grandmother), Thomas Sanford (9th great grandfather) Thomas Andrew Sanford (10th great grandfather). I never knew that Thomas Andrew Sanford existed until now. There are hundreds of sets of grandparents in our family trees but that does not make any one of them any less significant. If just one of them did not exist, we would not exist. It is a matter of science. All we are is the sum product of every person who preceded us. Nothing more and nothing less. Some scientists say that, perhaps, we even carry their memories. Everything is recorded in our DNA. Even our memories and life experiences. Even the memories and life experiences of our ancestors. Thomas Andrew was born in Essex, England, around 1607/1608, to Ezekiel Sanford and Rose Warner. He came to America on the Arabella in March of 1631 and settled in Dorchester, Massachusetts. Eventually he was granted land in Milford, Connecticut, where he settled permanently. Thomas had a brother named, Andrew, who also came to America, and settled in Hartford, Connecticut. Herein lies our family witch story. Most importantly, for me personally, this book also contains the story of my uncle and aunt, Thomas and Mary Sanford. 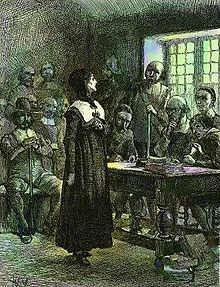 According to written documents, Andrew and Mary were indicted on witchcraft charges on 6 June 1662, based on the confessions of Rebecca Greensmith. The Greensmiths were not popular citizens. They had been accused and convicted for stealing and other petty crimes over the years. 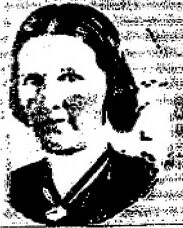 It was in prison that Goodwife Greensmith indicted the others. 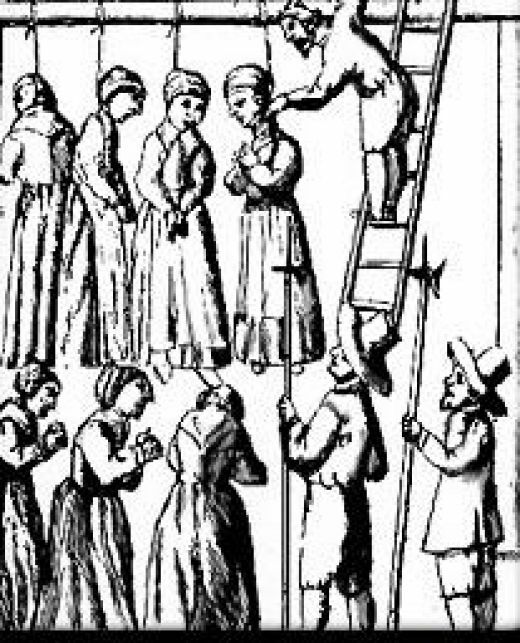 Goodwife Greensmith and her husband were both found guilty and executed in January of 1662 on Gallows Hill—near Trinity College, where a large crowd gathered to enjoy the entertainment. Another accusation came from Robert Sterne. “Robert Sterne testifieth as followeth. Their actual crime was conducting public meetings other than those held by the elders of the village—which, in turn, meant that they were consorting with Satan. The actual offense? They were caught dancing in the woods, drunk on alcohol. 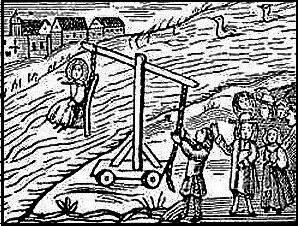 Andrew was acquitted, but Mary was found guilty and hanged on Gallows Hill. (Although one account I found said the following: Like some weird spectre of the spirit world, she disappeared!) Whatever actually happened to her, Mary, the mother of five, was only about 42 years old. Andrew moved his family to Milford, following the tragic loss of his wife and lived out the rest of his life near his brother, my grandfather. He remarried and died in 1684. My grandfather died in 1681. 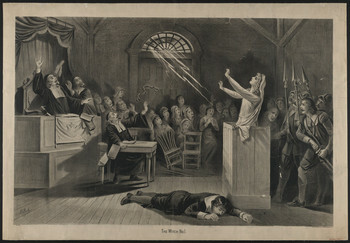 Although witch accusations were very commonplace in New England during this time, Andrew (and the rest of our family) must have been very fearful of repercussions. For it never ended in their lifetime. Just a few miles away in Salem, Massachusetts, something else was brewing and more lives would be lost. If you are interested in finding if you have any family connected to the early American witches, make an appointment with me at the Lewiston Public Library. Email : mkratts@gmail.com. You never know! Direct lineage to an accused “witch” may make you eligible for membership in the Associated Daughters of Early American Witches. This is a society of women who claim lineage to one of the individuals who were accused in early America before 31 December 1699. It is a genealogical society that seeks to preserve the names of those accused. It just may be the most unusual and fascinating American lineage society that I have ever come upon. Maybe some of you might consider yourselves prospective members. They are the Associated Daughters of Early American Witches. 1. To search for and preserve the names of those accused of witchery in that portion of Colonial America now the United States of America. 2. To locate the living female descendants of all witches who were accused in the American colonies prior to published records of same. Of course, we’re fascinated with witches and the story of one of the darkest events in American history. Are you connected by blood to this great tragedy? Maybe it’s time you find out. I have my own Salem ancestors. Through my father’s family lines there is one branch of my family tree that reaches back into old Massachusetts. My ninth Great Grandfather, John Norman, and his wife, Mary Ropes, my ninth Great Grandmother, are just two of my direct ancestors linked to this historic period and Salem, itself. 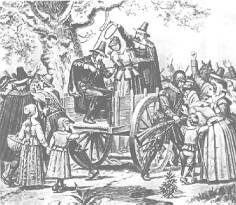 John Norman and his wife, Mary, lived in Salem during the famous Witch Trials. I’m not sure if they were involved in any way. Perhaps, one day when I have time to research a little deeper into their stories I can find some sort of family connections. There is quite a bit of information about their lives. Oddly enough this time period is extremely well documented and records remain to this day. Regardless… they were there. And in some way, because of them, so was I.
Mary Ropes was born on November 3, 1644, to George and Mary Ropes. Her father, George, had been “slain in the wars against the Indians.” Interestingly, she and John Norman both died in 1713. It was a very violent time. There are other interesting Salem Witch related burials at Broad Street Cemetery. George Corwin, High Sheriff of Essex County, is not buried too far from my grandparents. He carried out the arrests of the accused and executions of the condemned. He was buried first in the basement of his home as his family feared any repercussions. Years later his corpse was exhumed and reinterred. Jonathon Corwin, a judge and jurist during the trials, is also buried at Broad Street. I would love to go to Salem one day and visit with my grandparents and other family members beside their graves. My curiousity forces me to wonder and search for their personal roles in this horror, yet part of me is afraid to know the truth. Perhaps some things are meant to stay buried. Perhaps some things are meant to be found.